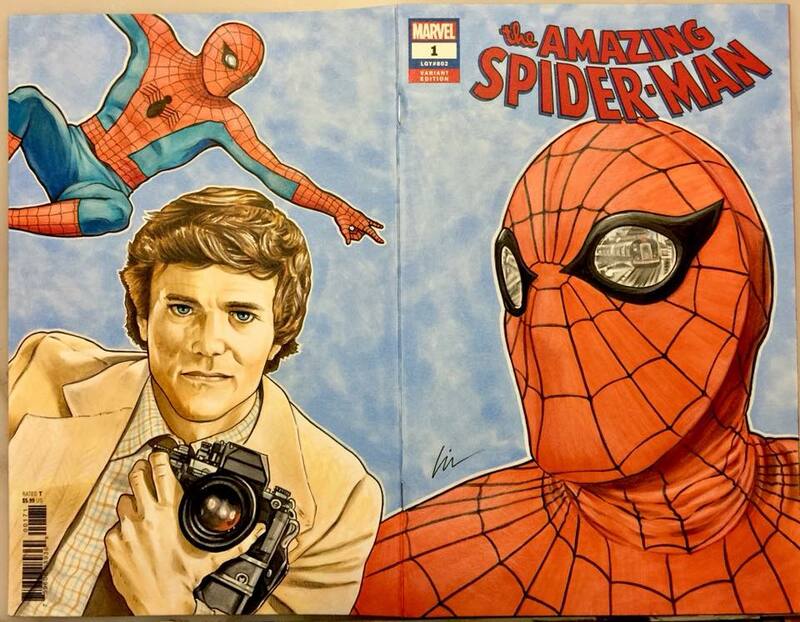 I’ve been a Spider-Man fan since the early-mid ’70s. The first comic I remember reading was a “Marvel Team-Up” issue featuring Spider-Man and the X-Men. 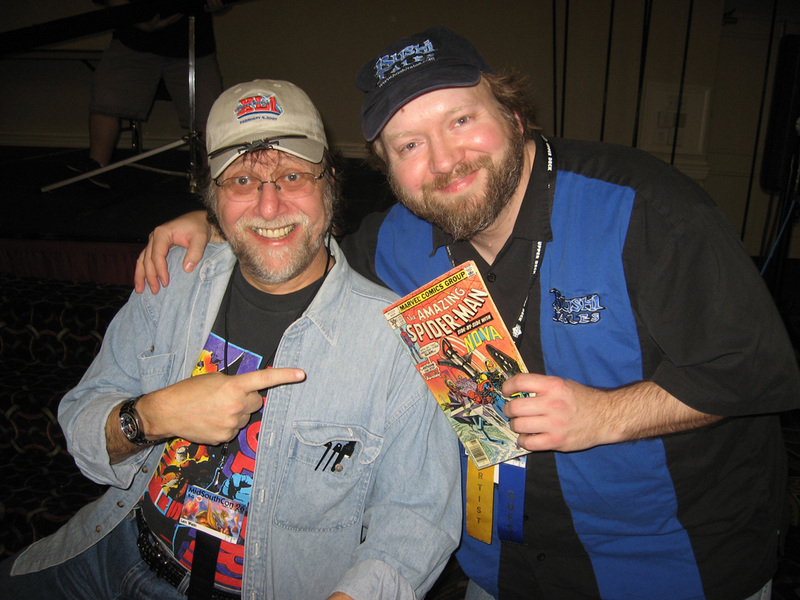 The first comic I ever bought was a copy of “The Amazing Spider-Man” (that’s me with it and writer Len Wein). I remember wearing a plastic Spider-Man costume and mask and having “web-shooter” wrist dart guns. As much of a Batman fan as I am, at one time Spidey was the comics king in my world. 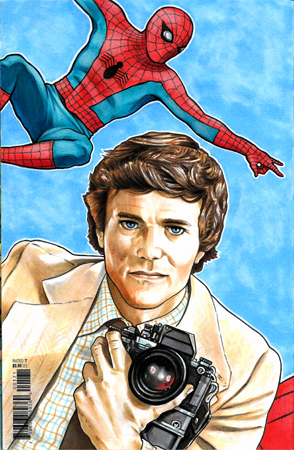 I had the POWER records, MEGO toys, watched him on “The Electric Company“, the ’60s cartoon, and loved the live action “The Amazing Spider-Man” TV series starring Nicholas Hammond as ol’ “Web-head“. 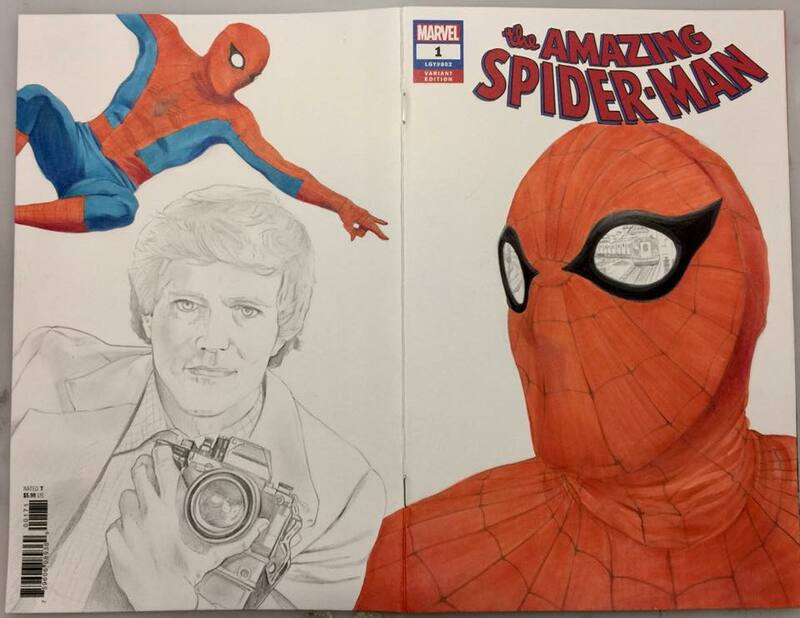 In this thrilling episode of “As The Lefty Draws” I’m going to show you how my Spider-Man (or “Spiderman” if you prefer) sketchcover came to be. Like my Captain America sketchcover last blog post, I started off editing the photo reference pics in Photoshop, and then lightboxing them. Using a regular yellow #2 pencil I drew a light outline and roughed the figures in. I then free-handed the rest of the drawing and finished out all the shading and details in pencil. 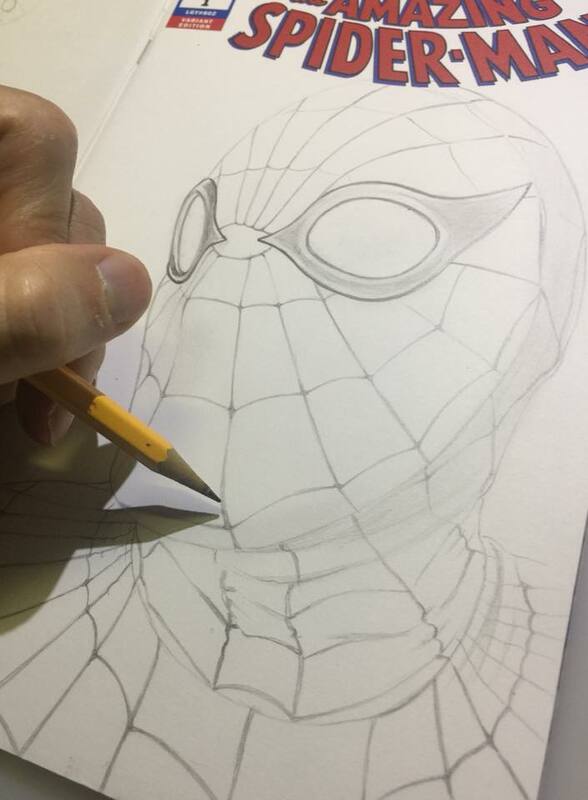 I couldn’t see a lot of the details on the camera, webbing, and face while lightboxing so I had to enlarge the reference photo on my computer to tell what I couldn’t make out. 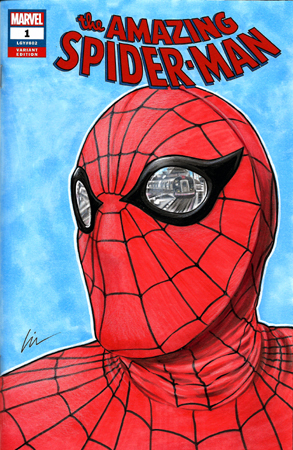 Decided to add a reflection of a subway train in his lenses instead of just having them silver’ish. 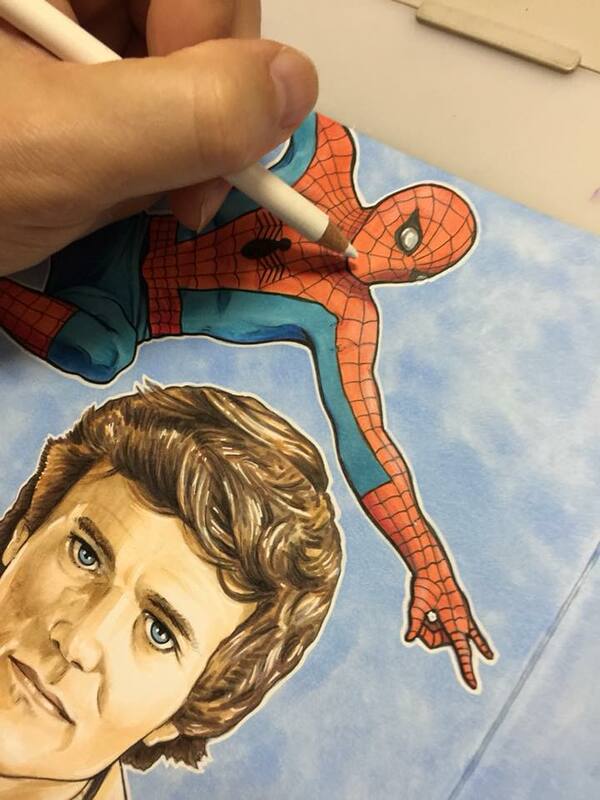 Once the pencils were tight and finished, I started coloring with my Copic markers. I had to swing by Hobby Lobby to pick up a couple red shades I needed. The ones I had on hand were way too dark for the majority of his costume. I’m never crazy about having to pick up Copics at Hobby Lobby since they keep them locked up and an employee has to take them to the register for you. It takes forever to get someone to help you out with them. I really need to make out a Copic wish list for my Christmas stocking! I used some red brown and a darker red for the shadow areas on the mask and costume, and came back over them with the lighter reds I had picked up. Used a few different shades of blue Copic for the rest of the costume. Used several shades of brown, beige, yellow, pink, and grey for the flesh-tones and eyes. The jacket and shirt area were really tricky with the plaid and herringbone, so I took my time and tried to hint at it than actually render it all. 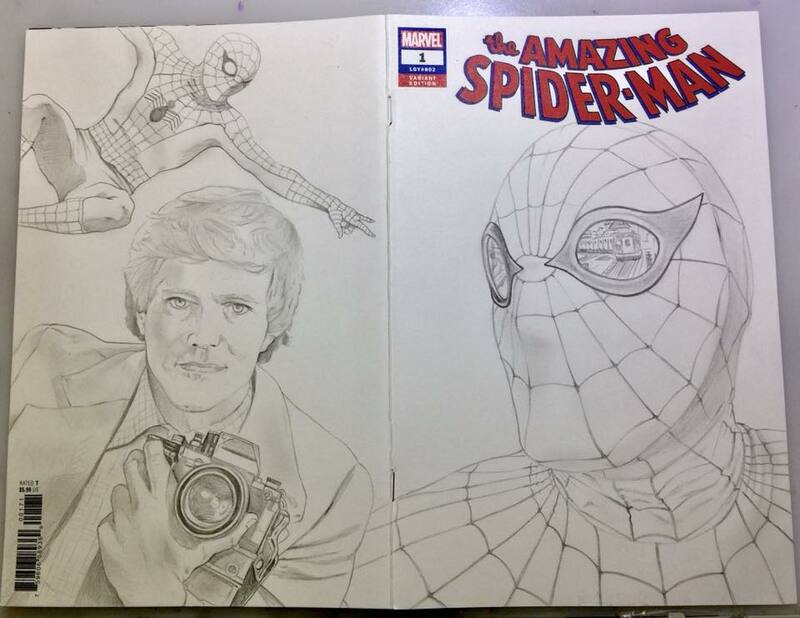 For the webbing (and lens frames) on the front cover mask I used a dark grey (warm 9 or 10 I think) and a medium grey (a 3, 5, and 7). Used greys on the camera and tried to stay away from using a black. I reserved that for my inking, which I did with a Pigma Micron pen. I used a white Gelly Roll pen to outline the figures and for highlights. 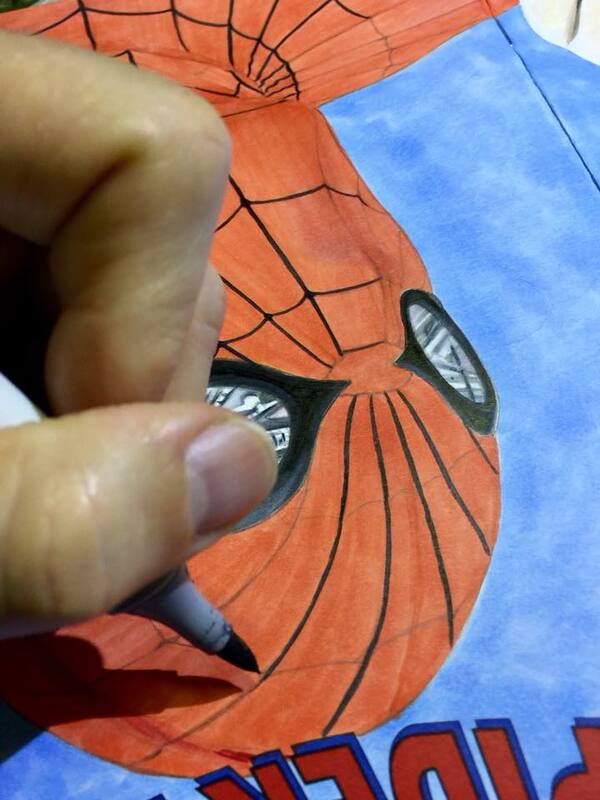 Then I used a white Prismacolor pencil to add more highlights and soften areas. Also used it on the mask lenses and camera lense to give a bit of a glare on them. The background I used a piece of tissue and a refill bottle of Copic blue to dab the textured look. I was going to add white webbing like on the TV show intros, but thought that might get a bit busy. 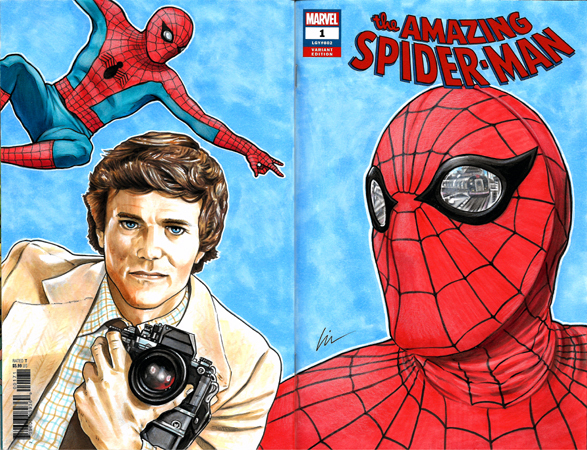 And here’s the finished wraparound sketchcover! 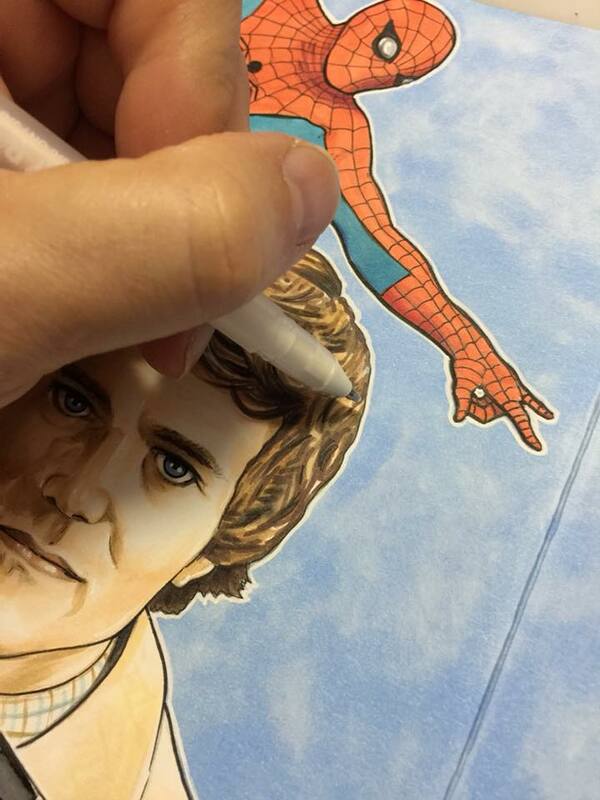 This Spidey is already spoken for by my friend Eric Crimmins (Eric’s Secret Stash toys) and I’ll be delivering it to him at the Memphis Comic Expo next month. Eric and I both will be set up at MCX (AKA “DonnieCon“) and I’ll have several other of my comics for sale there. You can also buy them at The Cellar in Bartlett, TN. Hope you can swing on by- ’nuff said! PS- I’ve been doing a new podcast with my “Bushi Tales” co-creator Dave Beaty. You can listen to the Rogues Radio Podcast here. 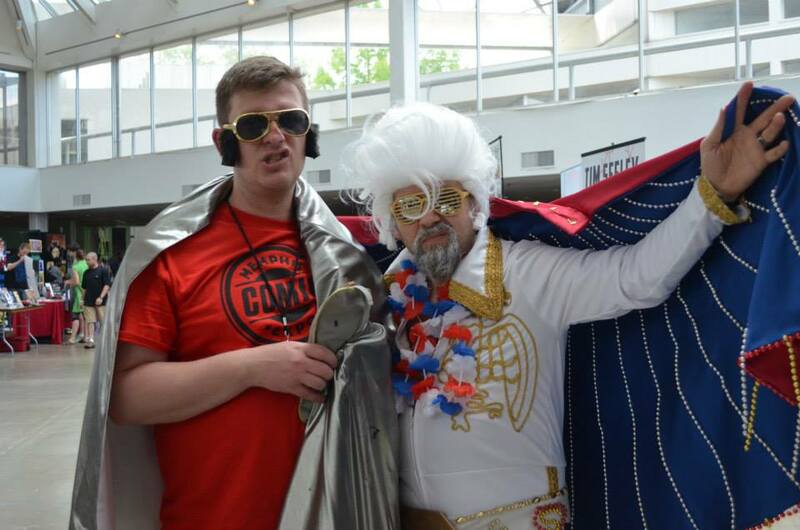 We talk comics, art, cons, and more!